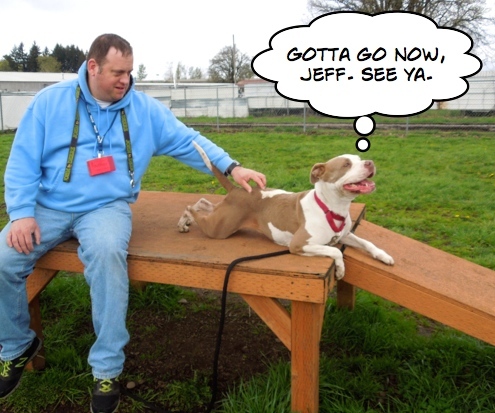 It’s been another busy week at Willamette Humane Society. We have had so many wonderful adoptions recently. 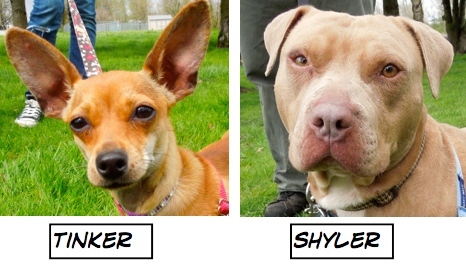 Some dogs were at the shelter such a short time, I never even met them. 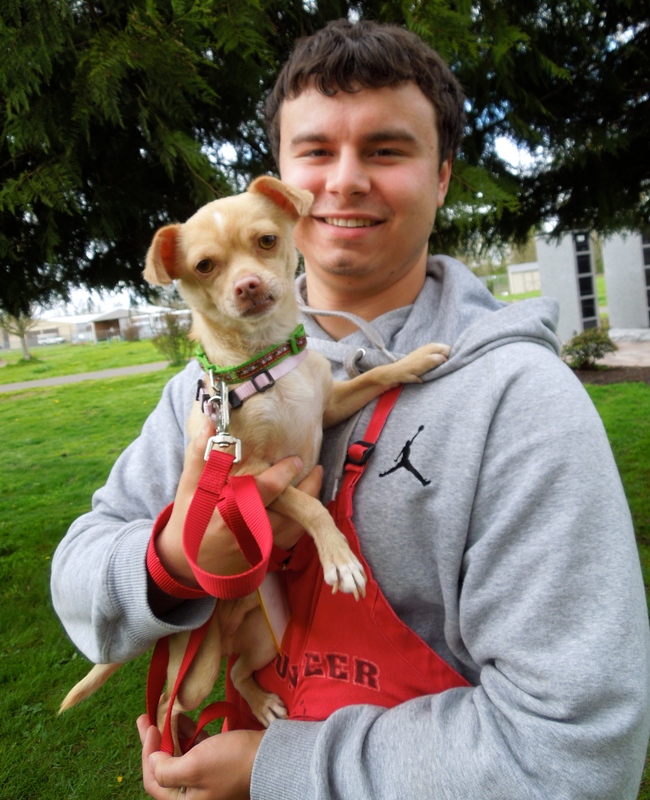 During the past week there were 23 dog adoptions! Of those, eight were Blog Dogs. 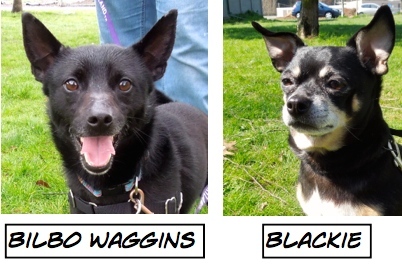 On Sunday afternoon I happened to see two new dogs going home and even though they were not “official” Blog Dogs, I asked if I could take their pictures. 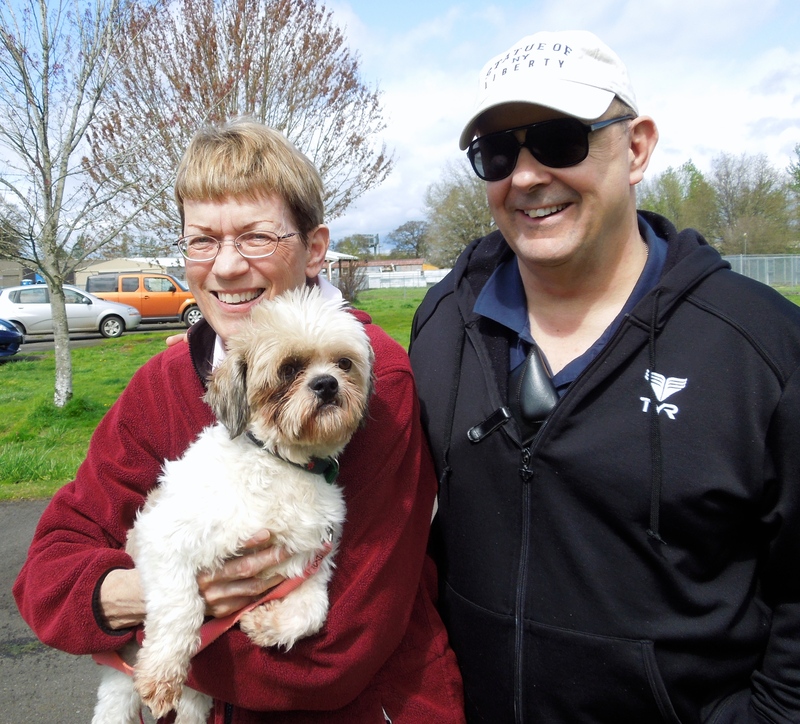 First, one of our own volunteers, Gerri, and her husband took home Rugsey. And here was newbie Indy going home. Does he look happy, or what?! One other adopted dog I’d like to mention is Chevy. He came to us after living much of his life on a chain. 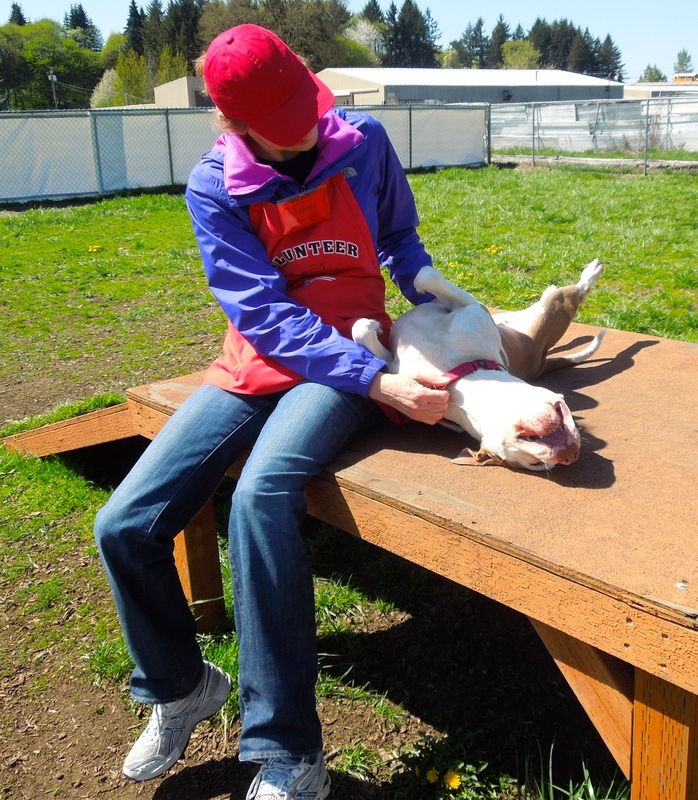 He spent a long time in our ISO kennels because he was very sick with kennel cough. It hit him so hard he didn’t even want to get off of his bed for a treat I offered him a couple of weeks ago. So I was thrilled when I saw this picture of him going home this week. 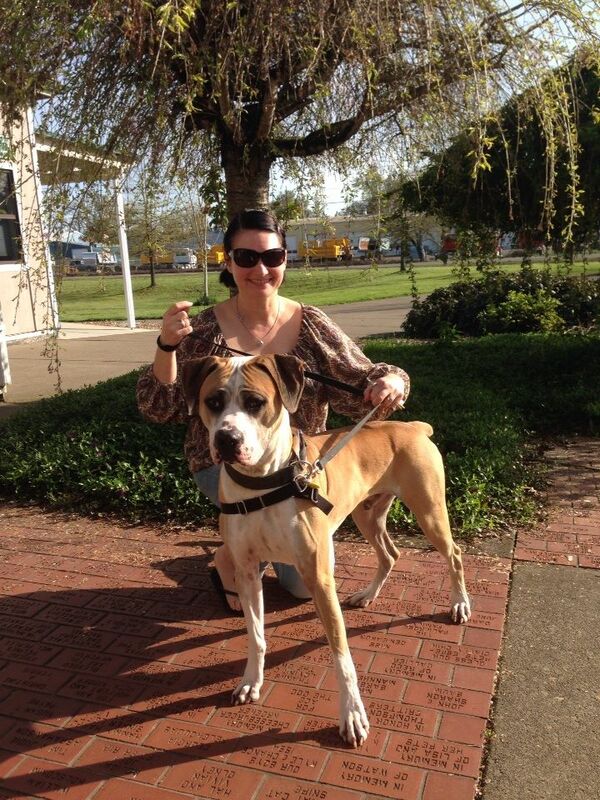 Here’s what Jen Kaser, our Shelter Director, wrote about this big boy. 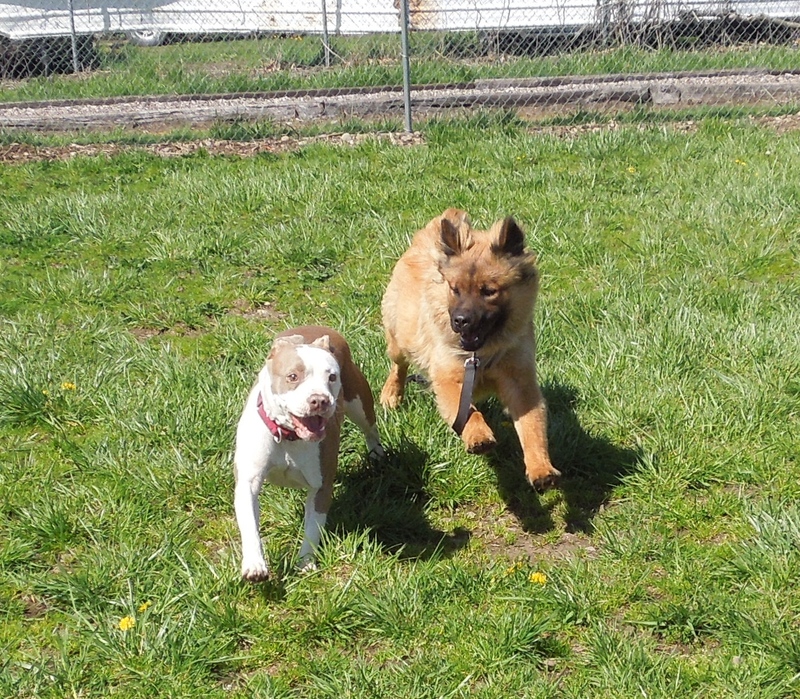 Sunday’s play group in the “rowdy” yard could have been called “The Donna and Teddy Show.” They are both newbies and became instant best friends. 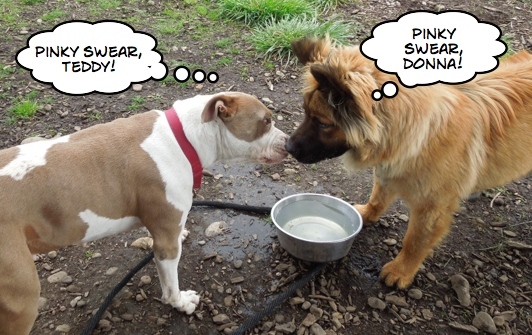 Here’s what I overheard during their antics. Remember when you were a kid and made a pinky promise with your best friend to be best friends forever? 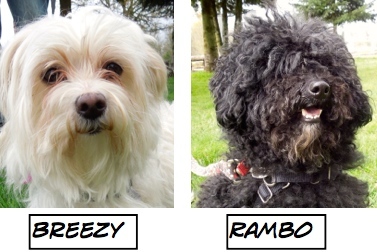 Here is the dogs’ version. 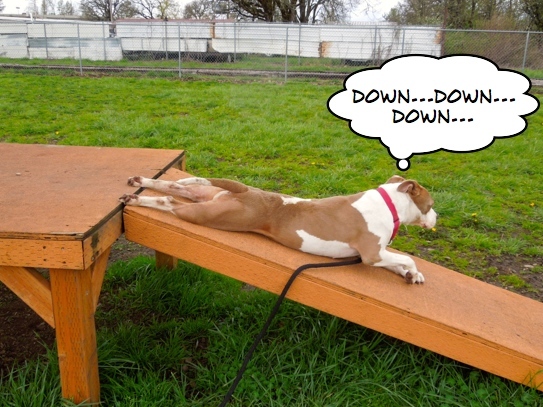 Donna was enjoying her time on the platform with Jeff, when she suddenly had an idea. None of us had ever seen such a sight and couldn’t stop laughing. Donna was a little embarrassed. A little later Charlie was feeling uneasy about the height of the platform and Donna decided to reassure him. When you’re best friends, sometimes words are not needed. I had to get a shot of Jeff and the two Charlies. Charlie on the left got adopted this week. 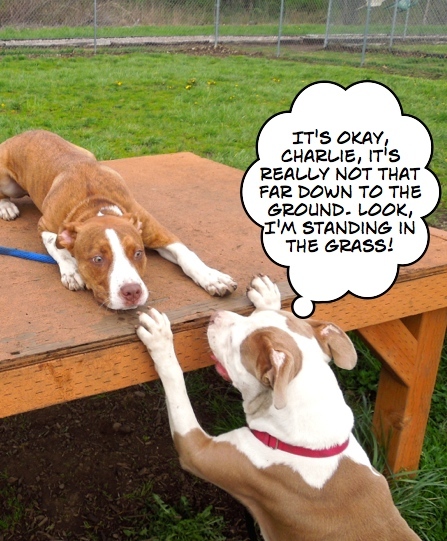 Charlie on the right is still waiting for his perfect family. I’m the life of the party! You probably feel as if you already know this sweetheart from the play group shots. 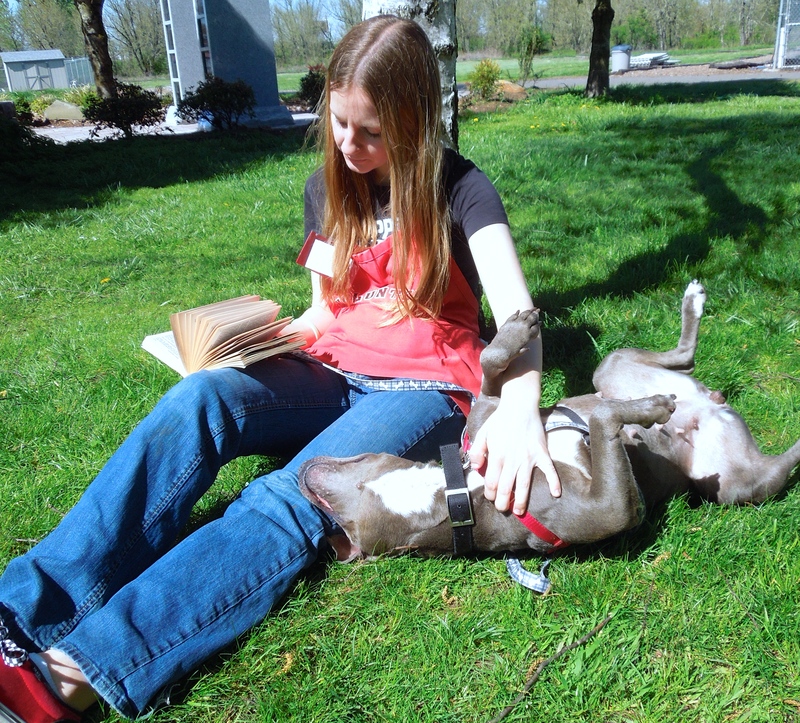 This is Donna, a four-year-old Pit Bull Terrier mix. She is such a wonderful girl. 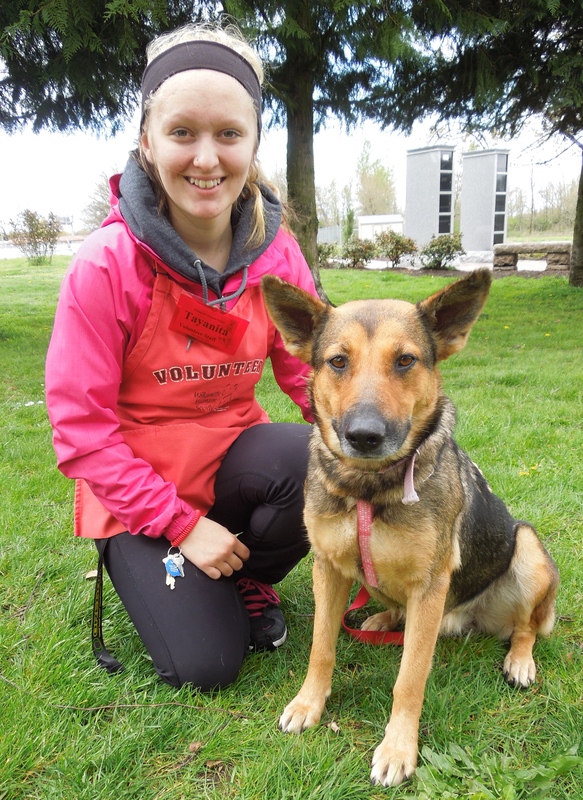 She gets along well with all kinds of dogs, loves people, is playful, happy, and walks well on leash. She is one of our S.T.A.R.T. 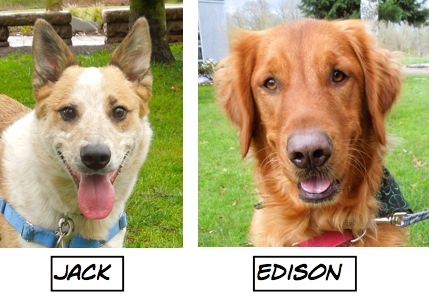 dogs from California. 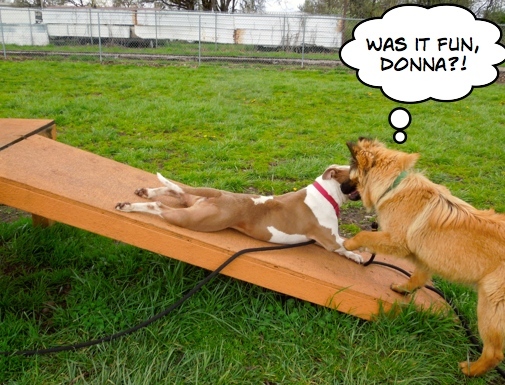 Some family is going to be mighty lucky when they adopt Donna. I loved spending time with her on Sunday. Here she is with Bruce. 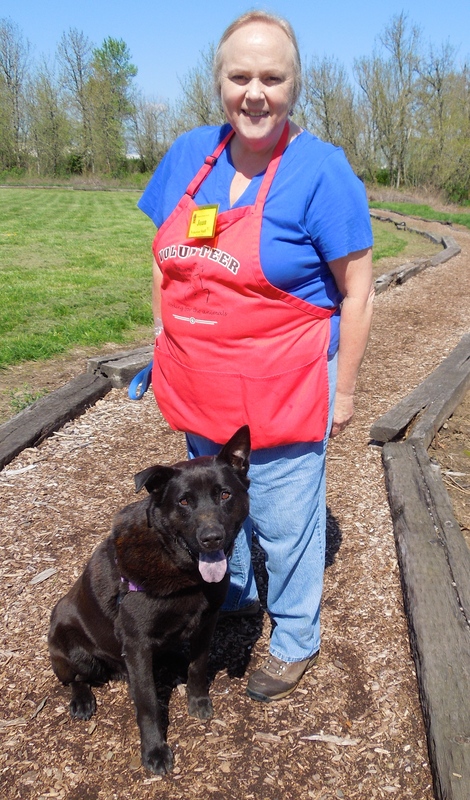 Here Donna was today with Jolene. She just loves to have her tummy rubbed! I’m the other life of the party! 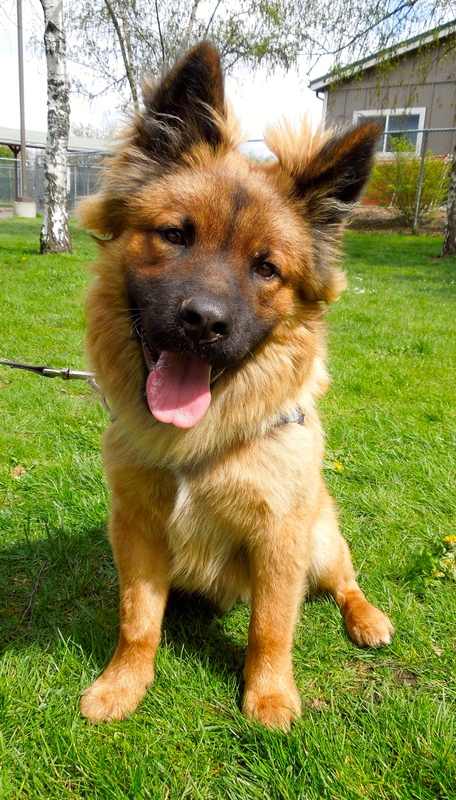 This is Donna’s best friend, Teddy, a nine-month-old Chow Chow mix. 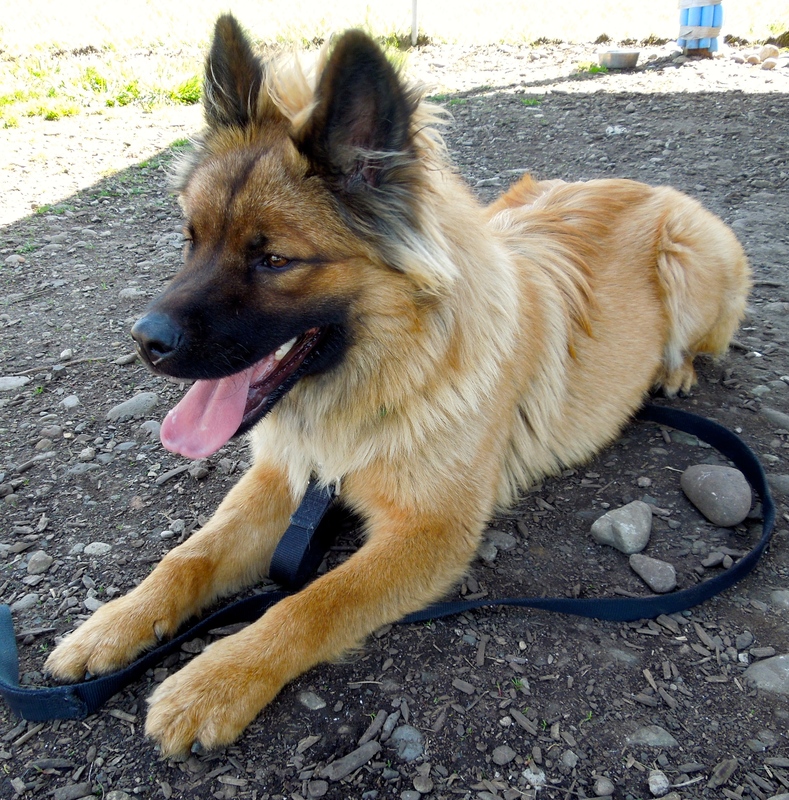 As you saw in the play group photos, Teddy has a ton of energy. He’s still a youngster and could use some of the WHS training classes so that he will mature into a well-mannered adult. 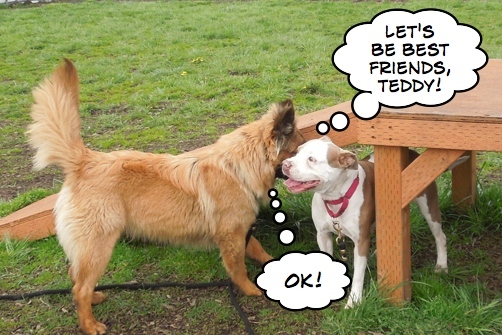 Teddy would make a great jogging or hiking partner. He’ll make a great addition to a family. Here he is on Sunday with Alexis. 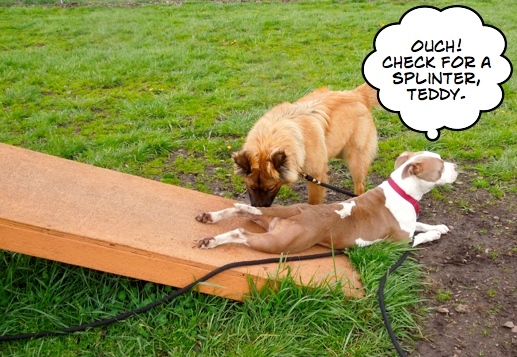 Jolene and I decided to give Donna and Teddy a play date today. They had a blast. All that running makes one tired. I’m waiting for just the right fit of a family. Maybe it’s yours! Here she was on Sunday with Taya. She has such an expressive face. Taya and I both really enjoyed our time with her. Looking for a small package with a big heart? That would be ME! 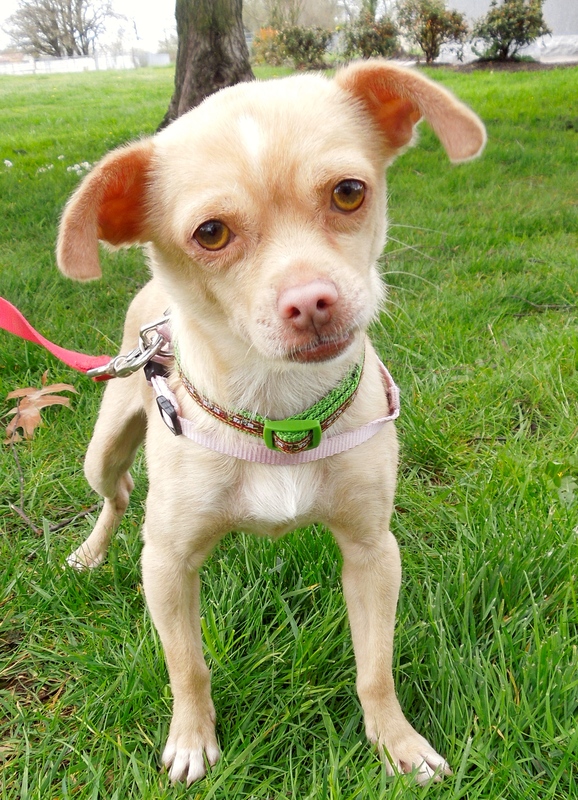 This is Martian, a two-year-old Chihuahua mix who, despite looking very worried, is actually calm and friendly. He is quite shy, so would do best in a home with adults or older kids. 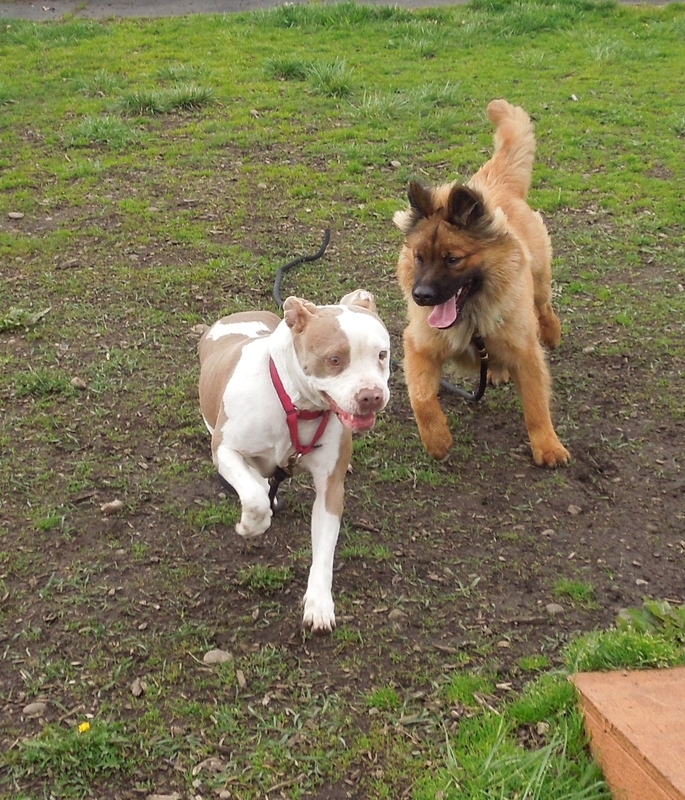 He was in play group on Sunday with the little dogs and seemed to enjoy himself. Here he is with Jacob. I think he looks like a little lamb. Here he was today with Kathy. I’m in a foster home, but I’d love to meet you! I could come to the shelter to see you! 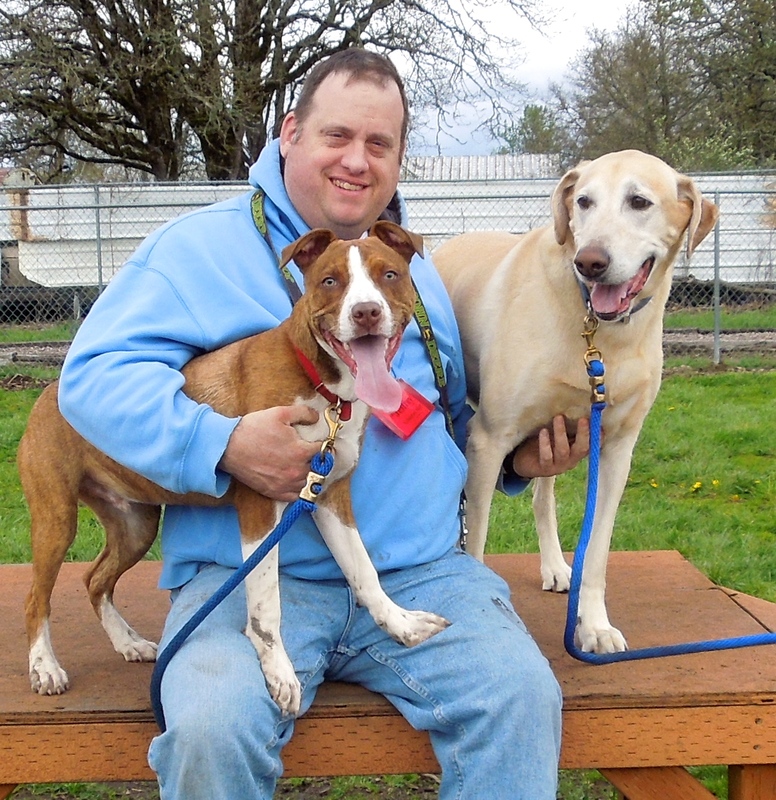 Patches is looking for a family who will continue the patient and understanding care that Jolene has started. She needs someone who has experience with shy dogs. 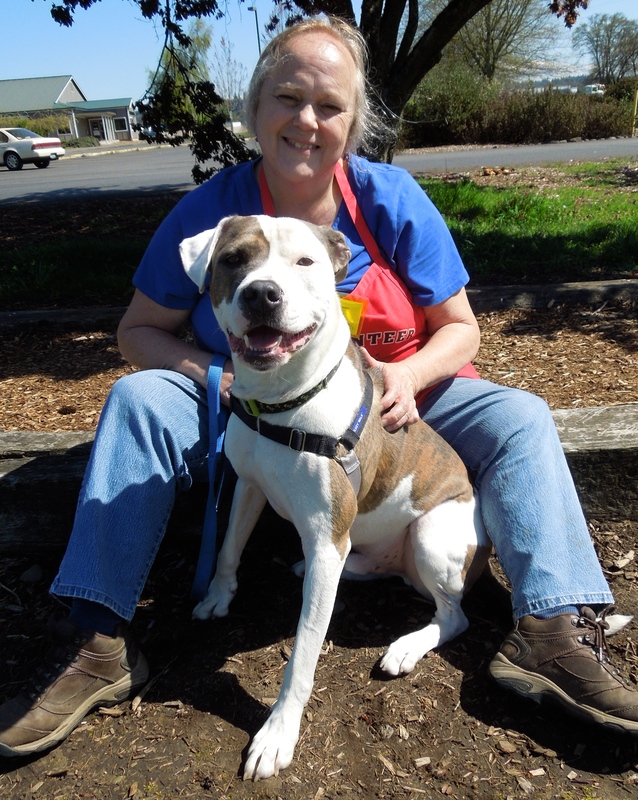 She has become a staff and volunteer favorite and will be a loving, devoted friend when the right person comes along. 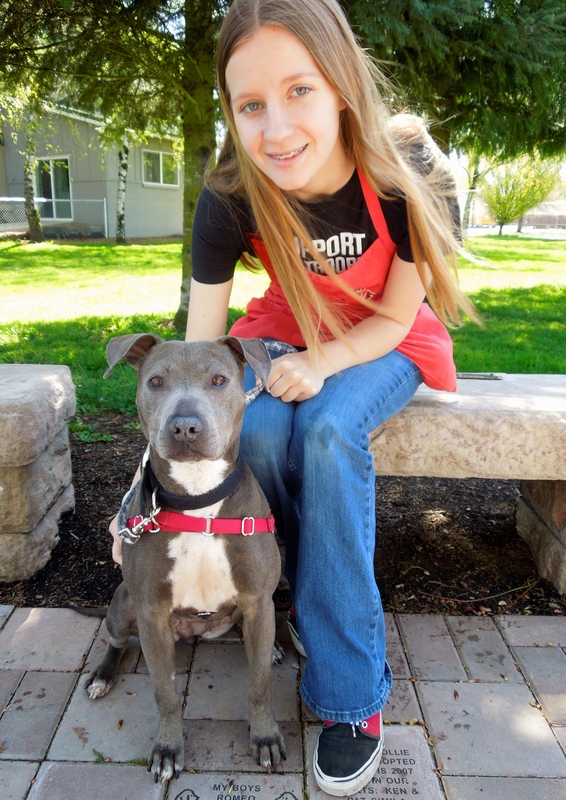 Here she was with Jolene J. soon after she arrived at WHS. I’m still here waiting for you. 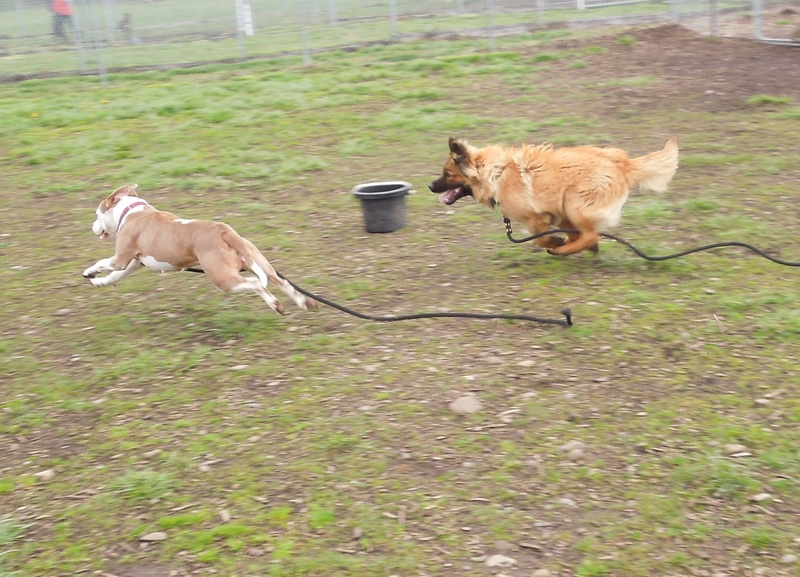 I knew Joan would take out Grommet first and again after everyone had been walked today. 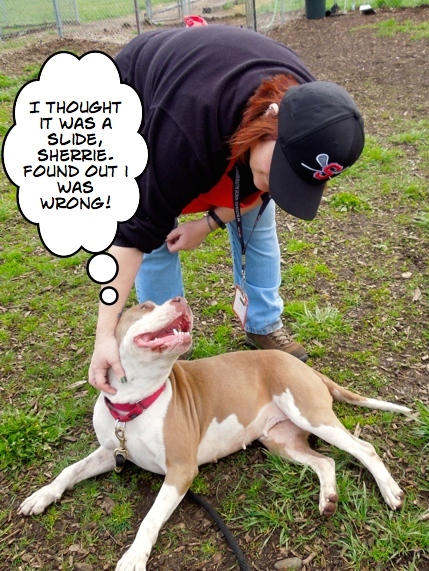 We still find it so surprising and disappointing that this wonderful dog has not been adopted yet. 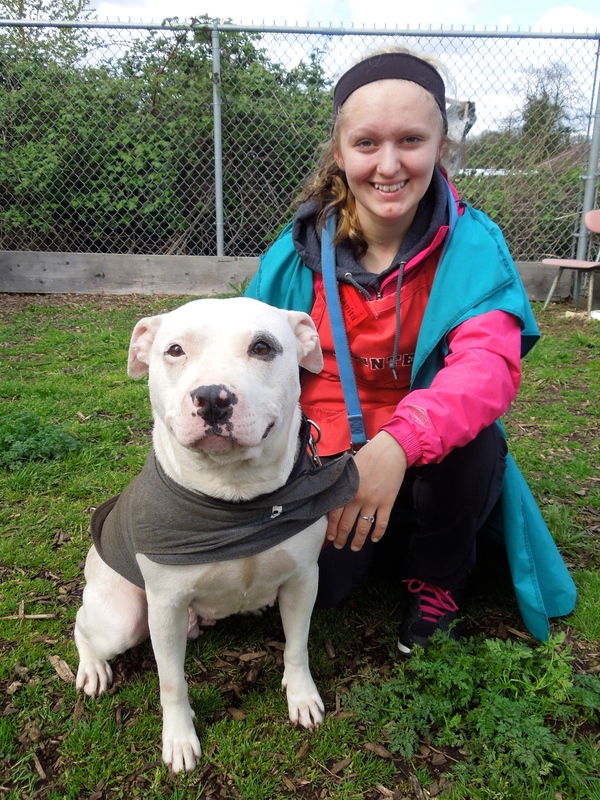 Grommet has been waiting at the shelter since the end of January. 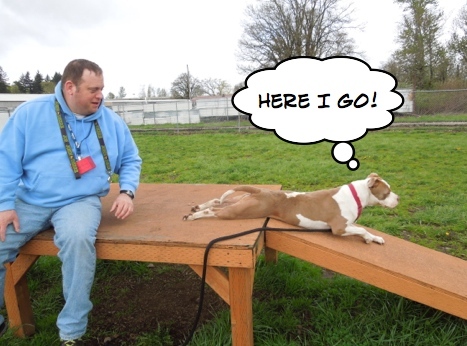 His kennel presentation needed some work when he first arrived, but it has improved greatly. 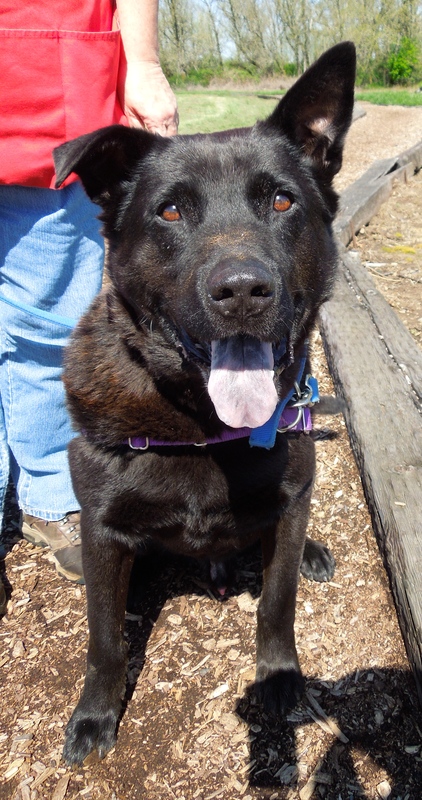 He is a six-year-old Lab/Chow mix. He needs a secure yard and wants to be mainly an indoor dog. 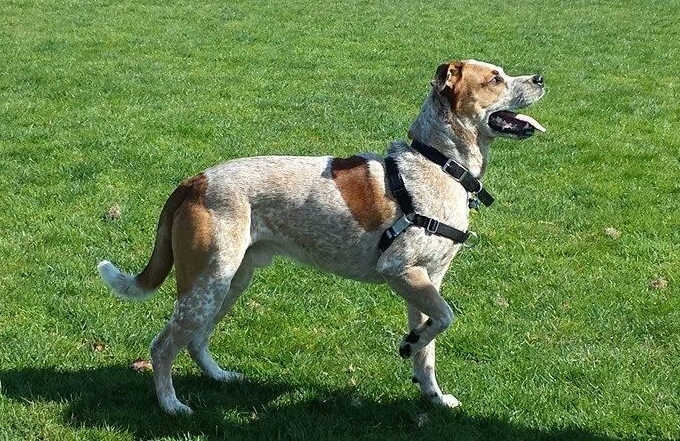 Grommet walks well on leash and loves being around people. 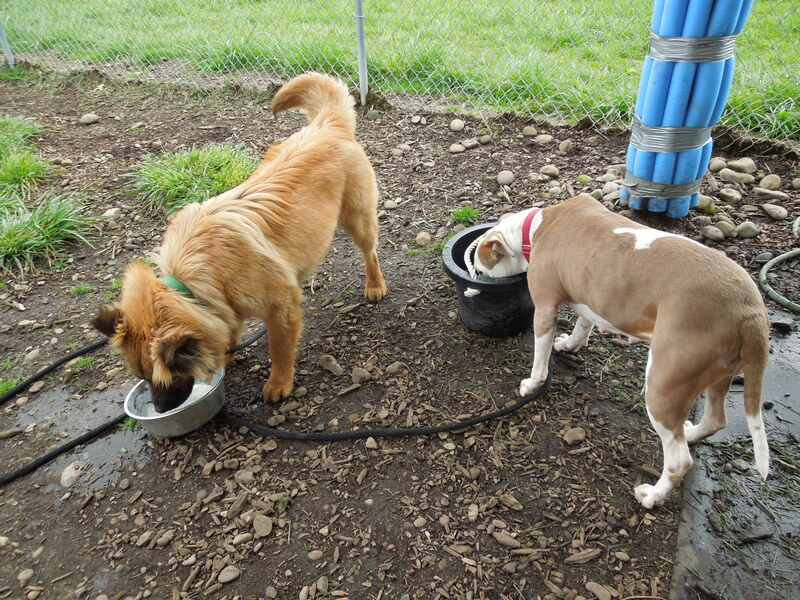 He gets along with most other dogs and enjoys play group. I am hoping that next week I can tell you that he has found his forever home. Need to exercise more? Me too! We could do it together! 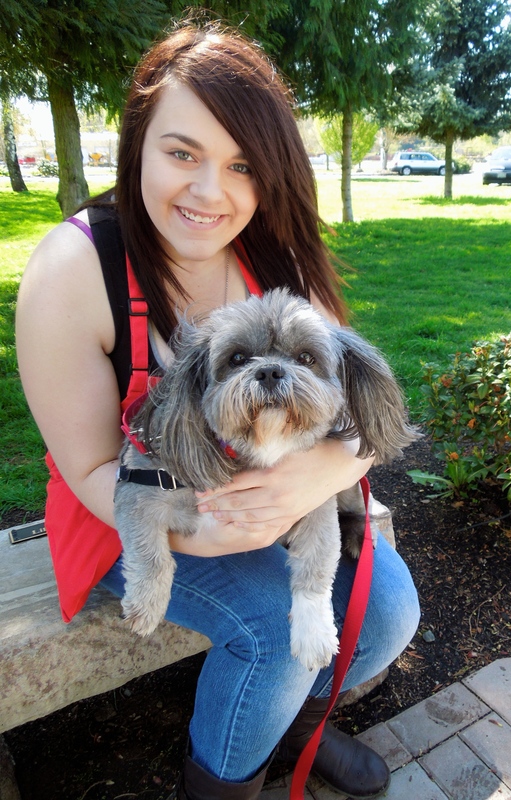 Today Amber spent some fun time with newbie Calvin, a seven-year-old Shih Tzu mix. Calvin is a delightful little guy. However, he really needs to exercise more and eat less (he weighs in at 34 pounds!). That’s where you, his potential owner, would come in. Calvin would love to take walks around your neighborhood, then have a light supper and curl up at your feet. 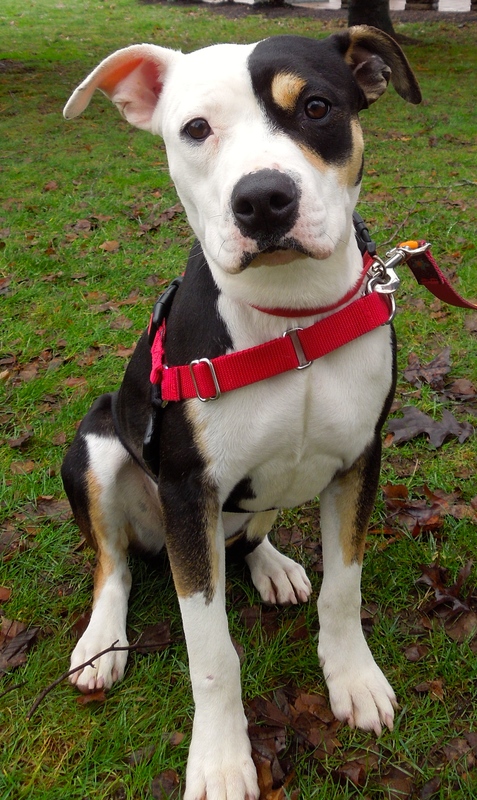 He would do best in a quiet adult home as an only pet, as he is uncomfortable around other dogs. He is a loving, sweet boy hoping to be someone’s new best friend. Yep, for the second week in a row, Jane has won as Emelynn’s pick of the week. Neither of us understands why this little girl hasn’t been scooped up by a new family. 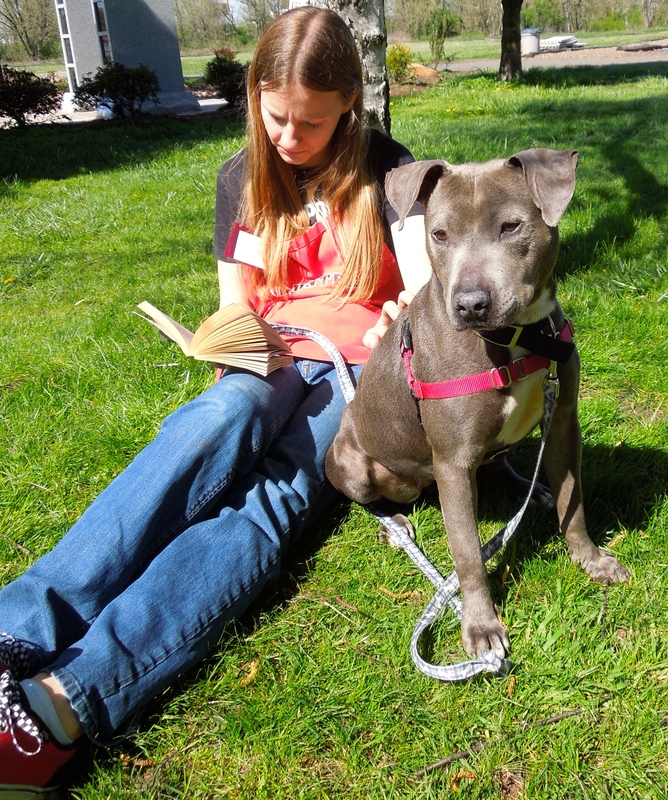 Jane is a two-year-old Pit Bull Terrier mix and while she can be a bit shy, she has come a long way since she first arrived at WHS. 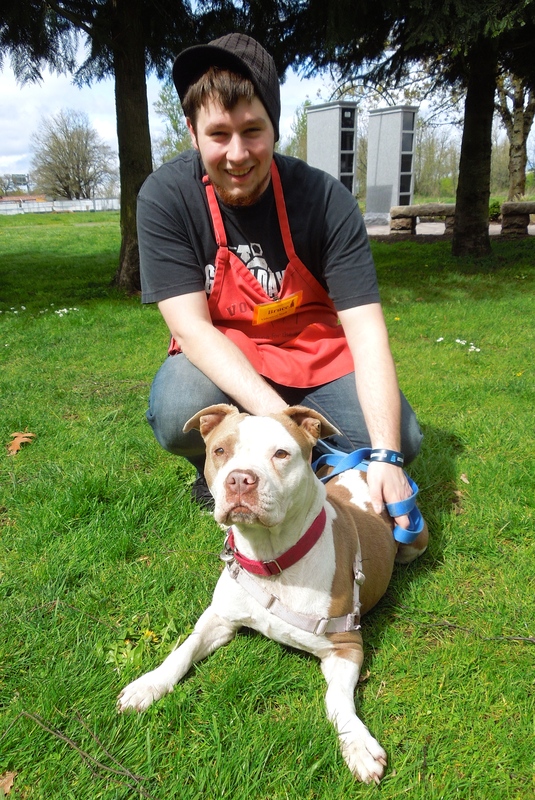 We hope this sweet girl will find her new home quickly. 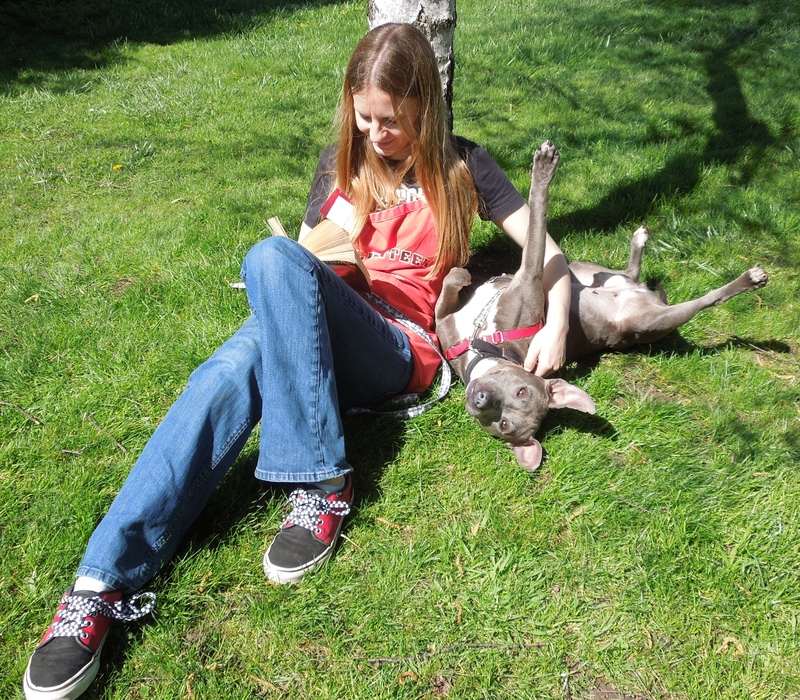 Later, after all the dogs had had their walks, I found Emelynn and Jane sitting under a tree enjoying the spring afternoon. Emelynn was reading and Jane was not. I’m back. I need to be in a family with older kids! Yes, Clyde is back at WHS. 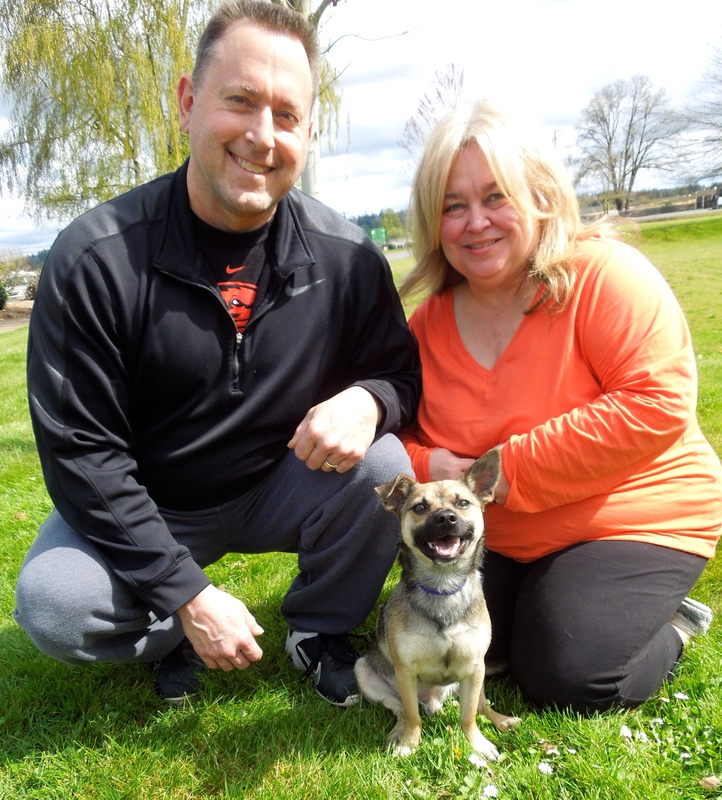 While the family who adopted him loved him, he was too enthusiastic for their young family. 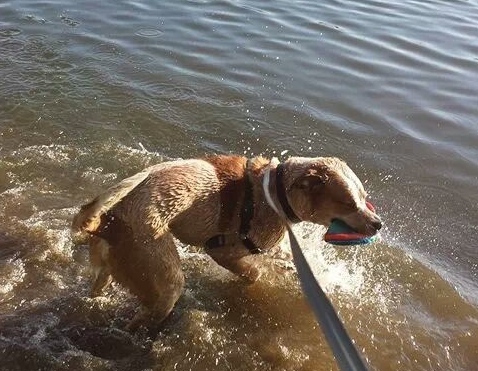 With his energetic play style (he LIVES to play fetch! ), he can be too much for small children. 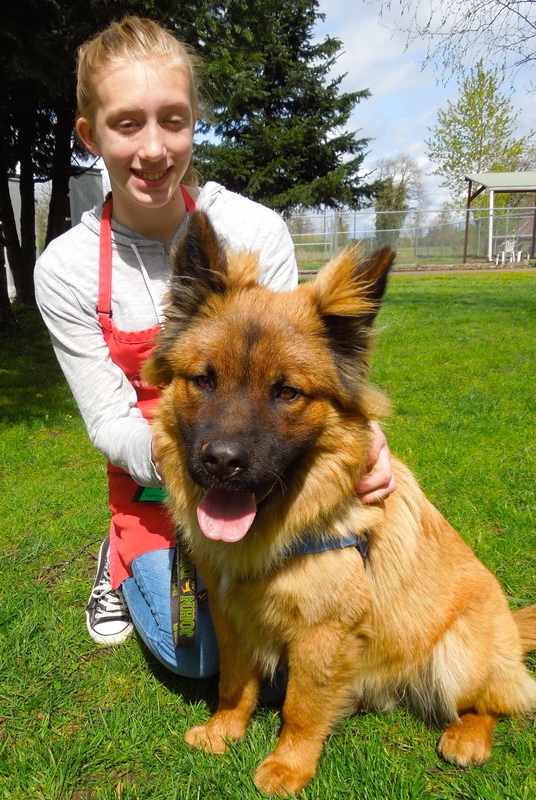 Clyde will make a wonderful addition to an active family with older, sturdy kids. We’re hoping he will be quickly adopted by his perfect fit family. Joan spent some quality time with him this afternoon. I’m new here and I’m looking for a relaxed family to love me. I met Hugo for the first time today. 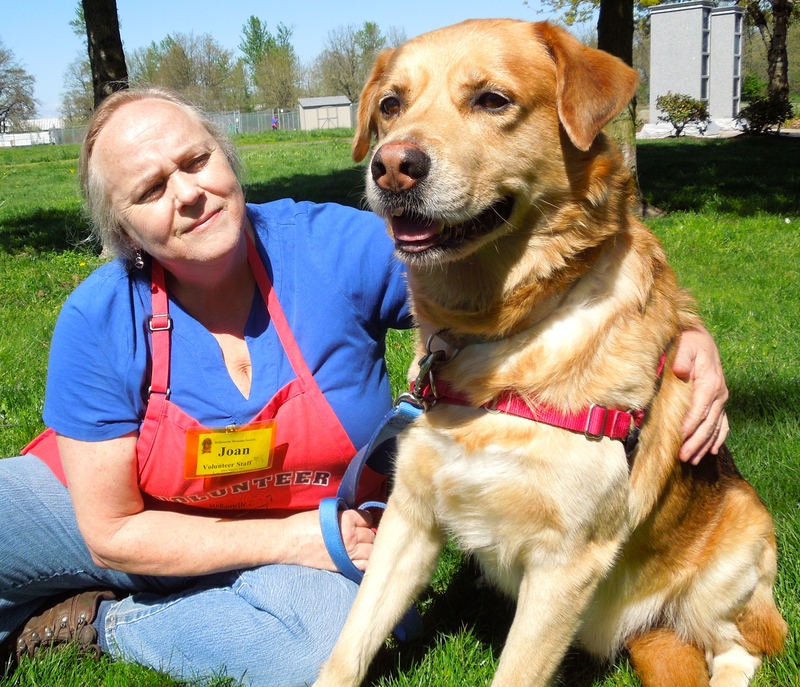 He is a seven-year-old Shepherd/Labrador Retriever mix who is a gentle giant. 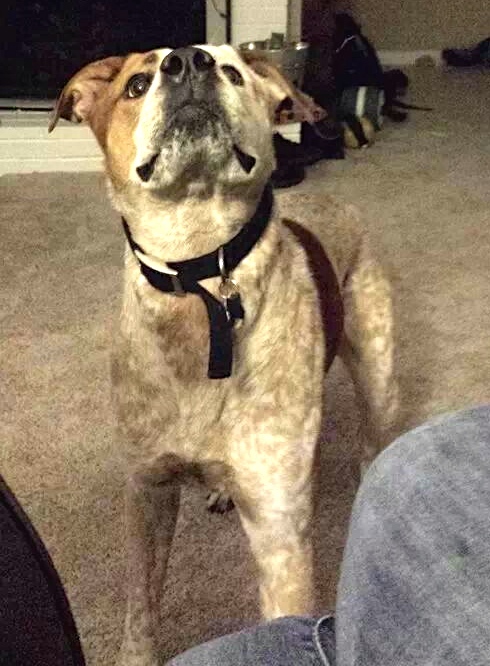 He has a great history with kids, enjoys a game of fetch, but also likes to take it easy and hang around the house. He wasn’t excited about my hot dog bits which surprised me, but did like just being with Joan and she said he walked well on leash. His nose has the most interesting pattern! I’m a bit shy, but I warm up quickly! 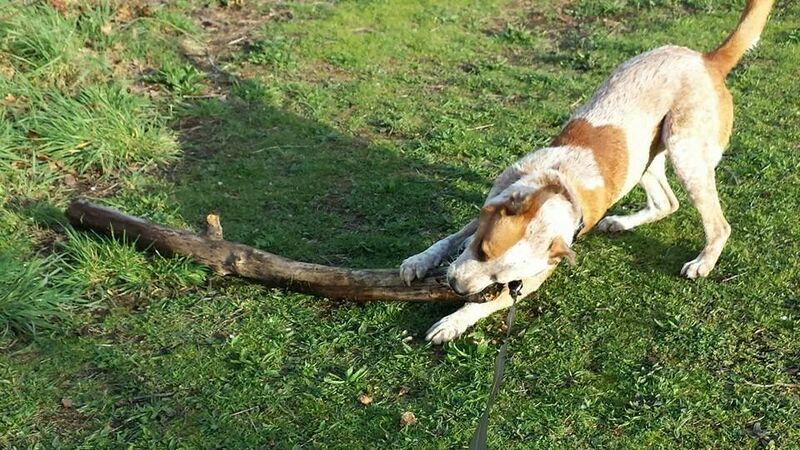 The last dog I want to mention is a new S.T.A.R.T. dog named Beauty. And she IS beautiful. 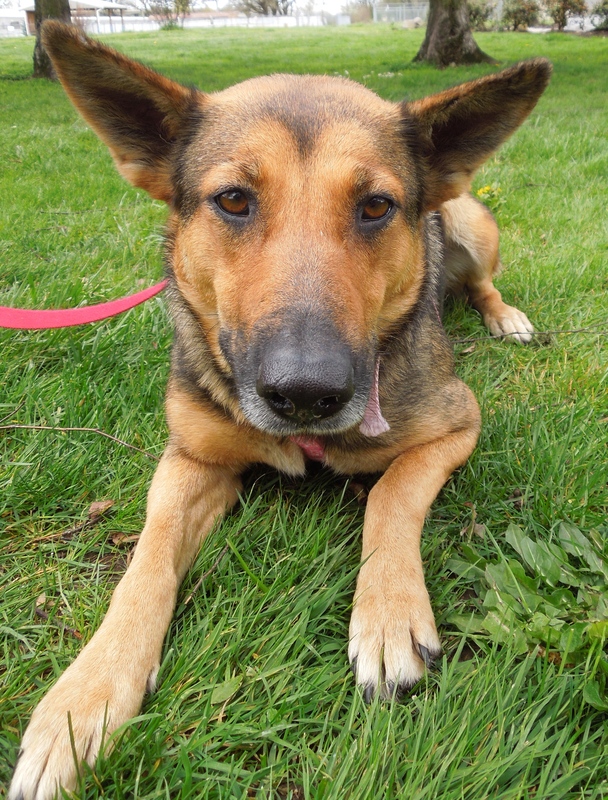 She is a six-year-old Shepherd mix who, though shy at first meeting, doesn’t take long to show that she enjoys your company. She eagerly ate my hot dog bits on Sunday and both Taya and I really liked her gentle spirit. She will do best in an adult home or one with older kids. We’re hoping she finds a new family quickly. I was so excited to get the following update about Dixon last week! I am extremely delighted for this happily-ever-after story! I’m thrilled to know that this favorite of mine is living such a great new life! That’s it for this week except for one last picture. 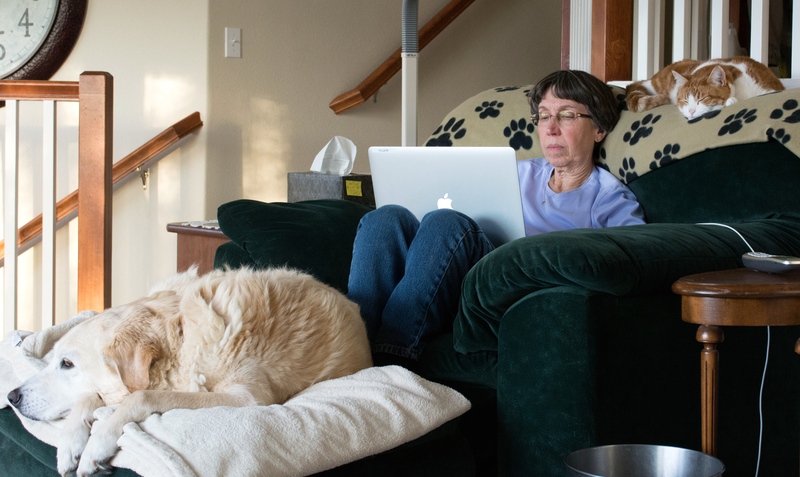 In case you’ve ever wondered about my own canine/feline family, here we are tonight (Scout, the dog and CJ, the cat) as I compose my blog post. This is our usual evening routine. 🙂 See you next week! It was nice to see you and your Scout and CJ relaxing. 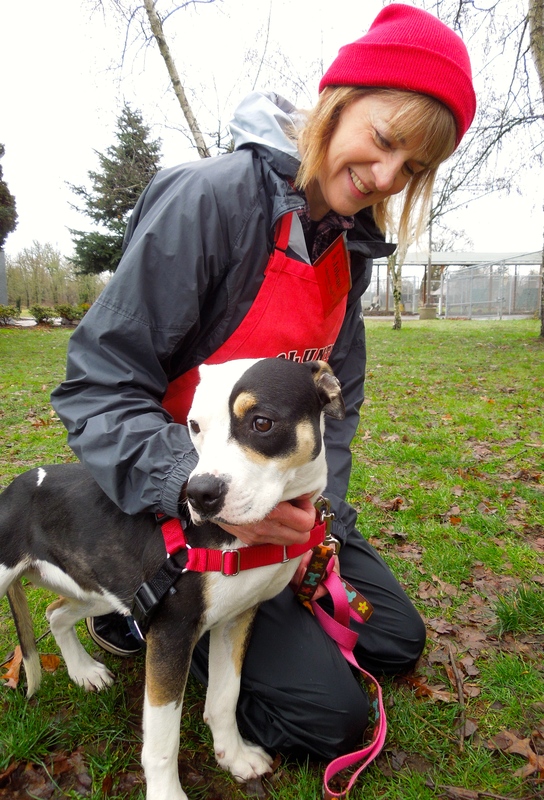 I loved seeing Patches again; really like that sweet girl, and she is so very cute. Perfect name. I knew she just needed some socialization. 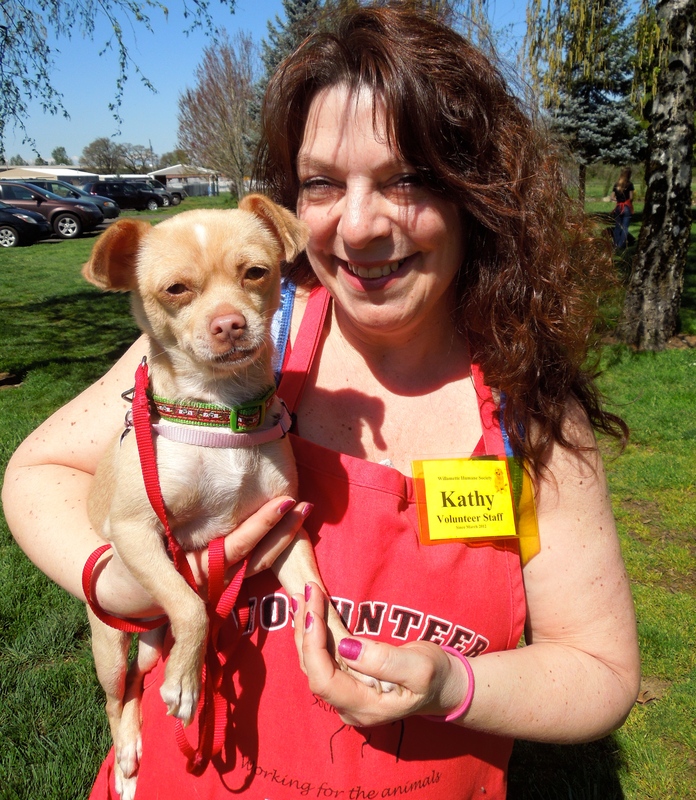 I also am eager for Grommet to find a home. I had him in a volunteer class, and he really began to warm up. I think he needs some confidence and wants to bond with a person (or a family). As usual, fun to see play group antics. You do such a great job with this newsletter! Thank you for all your hard work. Great update as always. We LOVE reading these. Wonderful.